The Demo Room was set up in the Einstein Center Digital Future to make current technological trends and research approaches vividly experienceable for its visitors. This everchanging venue brings together prototypes developed, and research results attained, by the different ECDF members, including various research institutions from Berlin’s universities and institutions of higher education, diverse industrial partners involved in the joint project as well as a number of start-ups. The Demo Room functions as an exhibition space that simultaneously generates a constant stream of new questions with regard to the most diverse aspects of society, to communal life, to culture and health, or to new forms of knowledge generation in a digital future. The diversity of the exhibits shows how traditional ways of thinking can be prized open, and illustrates the interdisciplinary approach of the ECDF. Current exhibits include: the “Mobile Lorm Glove” – a mobile communication and translation device for deaf-blind persons (Design Research Lab, Berlin University of the Arts); a tailor-made human heart valve prosthesis developed by combining the latest rapid-manufacturing and tissue-engineering technologies (Technische Universität Berlin, German Heart Center Berlin); the project “NurMut” (“Be Brave!”) – an interactive sound sculpture for persons suffering from dementia that aims through exploiting curiosity about the feel of things, as well as the interaction of modular elements, to compensate for the loss of technical know-how and the ability to interact with music systems (Berlin University of the Arts, Charité – Universitätsmedizin Berlin). The project “Soft Interaction Patterns” investigates the interactive possibilities of textile materials and surfaces that use traditional textile production techniques such as sewing, weaving and knitting, as well as conductive fabrics and threads, to produce equivalents of buttons, switches and sliders in textile form. Interactive textiles currently play a major role in research and innovation. E-textiles generally have the advantage that their application is both highly specific and widely varied (Berlin University of the Arts). T The non-profit start-up Calliope has set itself the goal of using a simple single-board computer to provide pupils from the third grade onwards with playful access to the digital world and permanently integrate digital content into the curriculum. 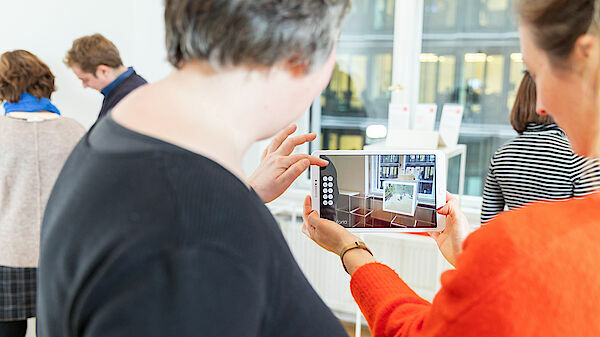 Shoutr.Labs is a Berlin-based start-up company that uses augmented reality to provide interactive multimedia content.